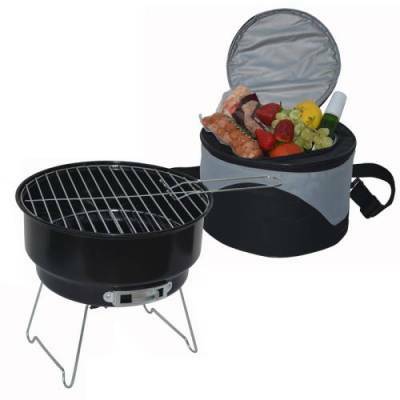 The Clever round 11.5" diameter carrier has a watertight 6 can cooler in the top and stores the grill in the bottom. Grill has a 10" diameter chrome grill top, 9" diameter chrome charcoal grate, black enamel metal base with adjustable air vent, grill handle, and chrome legs. Carrier includes a front pocket, durable rubber hand grip and adjustable shoulder strap (removable) to carry. Very compact.